Very good to hear that Cambridge artist Harry Gray will be providing us with a signature artwork on the Sidgwick Site this year. 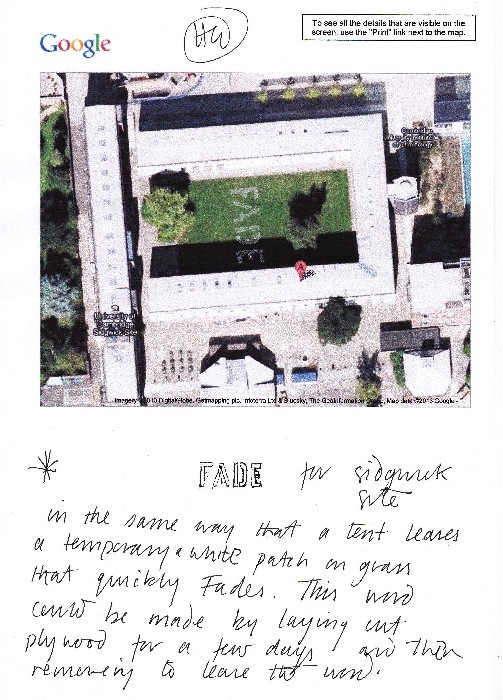 Plywood sheets will be laid on the lawn to starve the grass of sunlight and thereby leaving a ghostly imprint of the word ‘FADE’, which will indeed fade as the lawn regenerates during the course of the exhibition. Big thanks to Jamie Brittain from the Sidgwick Site for giving permission for the project, and to Paul Darlow from Travis Perkins for supplying the plywood sheets. Please do support Travis Perkins, another much appreciated partnership.